The burnt stalks of gorse are known on the New Forest as ‘blackjacks’. 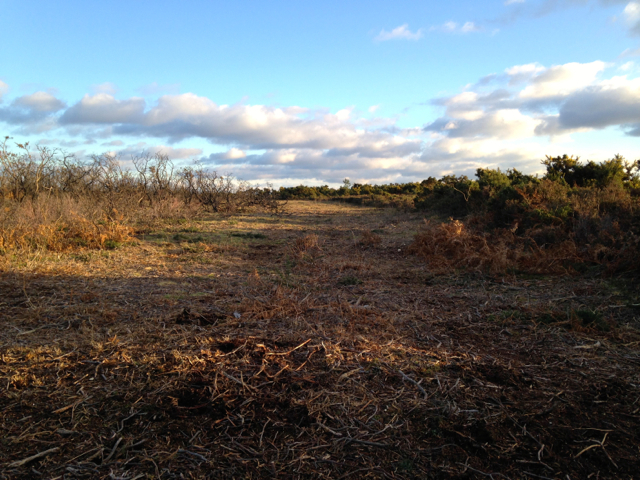 Visitors to the northern part of the New Forest recently (Febuary 2015) may have witnessed a technique for managing the heathland that has been practiced for generations, namely controlled burning. The Forestry Commission undertakes this activity now, which aims to regenerate the heather and gorse whilst hindering invading scrub, by setting fire to the heathland. Using fire to improve the heathland may sound counter-intuitive but the burning actually encourages new growth, which is beneficial to a variety of flora and fauna, as well as providing food for the commonable livestock. It also plays an important role in reducing the risk of wildfires in the summer months that can burn out of control and have a devastating effect on vegetation and wildlife. Heathland wildfires are particularly dangerous because they can burn below ground causing long-lasting damage to the peat and the mineral soil underneath. The law permits controlled burning each year from the first working day in November until the last working day of March. However, in practice it generally starts in early February because the worst of the winter weather is over, there are no birds nesting or animals producing young, the vegetation is still quite dry and the damp ground offers protection to the peaty soil. The process is strictly controlled and only a small percentage of the heathland is burned each year (on average 400 hectares) and only then in rotation, which traditionally is once every generation (about 25 years). 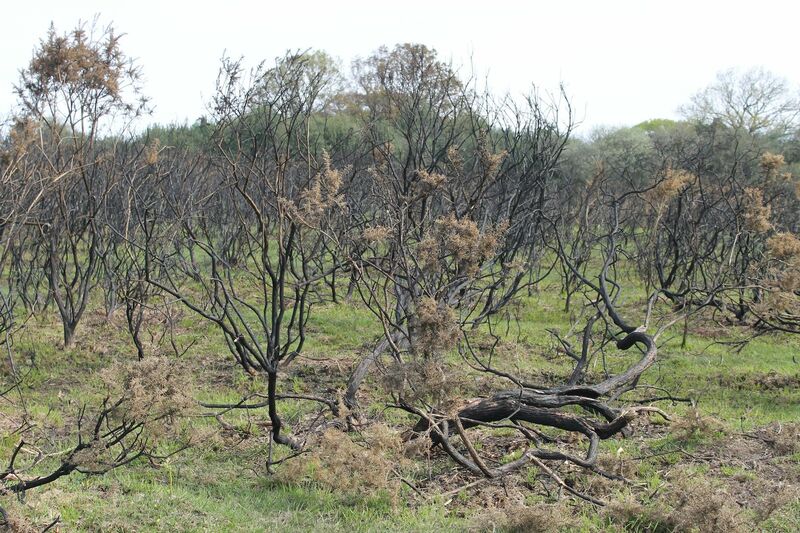 A firebreak is first established around the area to be burned, which is made by using a cutting machine. Visitors to the Forest often have mistaken these safety margins in the heath for tracks or footpaths. The firebreaks are used to prevent the spread of flames to other parts of the heathland. Only skilled and experienced staff are permitted to undertake controlled burning of the heathland. In times past however, the commoners often operated their own unofficial controlled burning effort because they felt that the Forestry Commission programme was ineffective or did not cover the areas of heathland they wanted rejuvenated for their animals. Happily today the programme is better coordinated and many of the Forest organisations, including the Verderers, are consulted prior to any burning programme to ensure their cooperation. But not everyone is in favour of the controlled burning and some argue that it actually has a detrimental effect on the heathland by reducing the nutrients in the soil. Nevertheless it is a practice that is still widely used, particularly on grouse moors in northern England, to encourage new growth. It also has one additional benefit that no other type of heathland management, including cutting or swiping, can provide and that is the reduction of ticks and the risk of Lymes Disease. A traditional benefit of controlled burning, but one not practised today, was the harvesting by the commoners of the ‘blackjacks’, the burnt holly and gorse stems, to sell as firewood. What you might see today however, during the periods of controlled burning, are ponies sporting blackened criss-cross markings over their flanks and hindquarters. This is a sure sign that they have been picking their way through the blackjacks and have become striped by the charcoal stalks of the holly and gorse stems as they pass by them. These haphazard markings can give them the appearance of very odd-looking zebras. The firebreaks, used as safety margins during periods of controlled burning, are often mistaken for tracks or footpaths. This entry was posted in New Forest, New Forest flora & fauna and tagged cattle, commonable stock, commoners, commoning, controlled burning, fire, Forestry Commission, gorse, heathland, holly, New forest, ponies, Verderers. Bookmark the permalink.